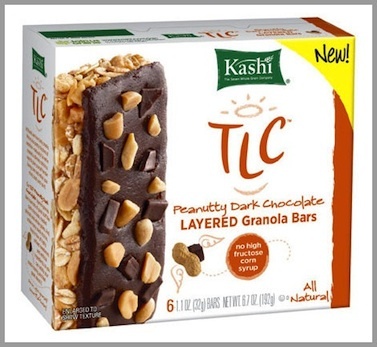 Save $1 with Kashi Bar Coupon. You can print or get this coupon mailed to you from Websaver’s website. Select the coupon, create an account at Websaver, and claim your coupons. Note, you must select at least 4 coupons before Websaver will mail them out to you. 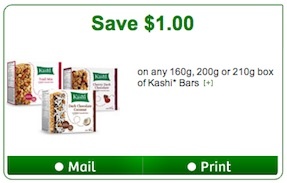 Kashi Bars coupon to save $1 on any 160g, 200g or 210g box of Kashi* Bars. These bars are really delicious! Kashi Bars are made with all-natural ingredients and a delicious blend of seven whole grains & sesame, great taste now comes in 4 flavours: Seven Whole Grains & Almonds, Peanut Peanut Butter, Cherry Dark Chocolate, and new Trail Mix.